When you envision the movement to legalize marijuana, what do you see? Is it a band of hippies or college students? Free spirits of the American West with long hair and peace symbol bumper stickers? If so, you aren’t alone in your thinking. Though public perception of marijuana and marijuana users has shifted with the accelerating movement to legalize the drug, many still believe that the drug is reserved for the young, liberal, and reckless. 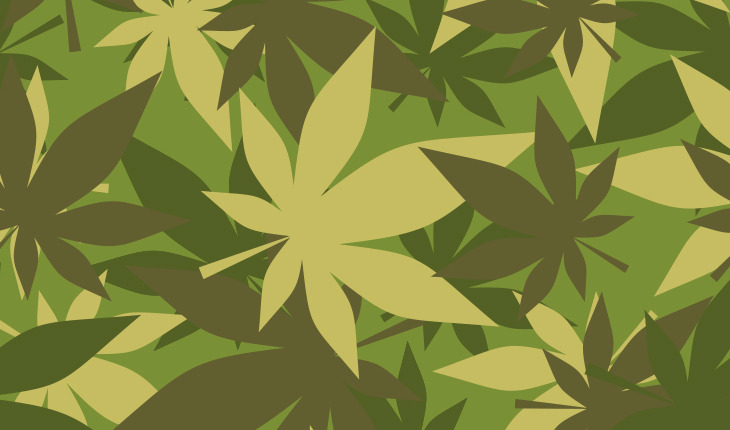 But an unexpected force is driving medical marijuana legalization in the United States: America’s armed forces veterans. The push by U.S. veterans to legalize marijuana is largely tied to the drug’s proven efficacy in treating post-traumatic stress disorder (PTSD) and chronic pain, two of the most common afflictions of active and non-active U.S. service members. According to the Veterans Cannabis Project, a non-profit organization with the mission of increasing the accessibility of medical marijuana for veterans, up to 20 percent of active service members suffer from post-traumatic stress. In many cases, this stress leads to significant self-harm or suicide. The numbers are staggering: each day, an average of 22 veterans commit suicide. Chronic pain affects an estimated 75% of female veterans and 50% of male veterans. The two disorders appear to be linked: according to researchers at the Department of Veterans Affairs, up to 80 percent of Vietnam veterans with PTSD reported chronic pain. Traditional medical practitioners doled out prescription medications as an attempt to address this epidemic in veteran populations, but in turn created an even larger epidemic. Veterans became addicted to many of the drugs that were prescribed, most notably opioids. According to Reuters, veterans are twice as likely to die from an opioid overdose than non-veterans. This coincides with the national epidemic of opioid abuse sweeping the nation. Reuters also reports that opioid drug abuse has claimed more American lives than the Iraq, Afghanistan, and Vietnam wars combined. Veterans organizations have taken to lobbying for the legalization of medical marijuana to treat PTSD and coinciding chronic pain, in hopes of providing alternative, less addictive treatment options for suffering veterans. Their efforts have been fairly successful. 29 states list marijuana as an approved treatment for PTSD. Prominent political figures across parties have also endorsed the use of medical marijuana to treat PTSD and chronic pain in veterans, an unusual occurrence considering the drug’s controversial nature. Among the most prominent groups lobbying for the legalization of marijuana to treat PTSD and coinciding disorders is the American Legion, a traditionally conservative organization. The American Legion is pushing not only for legalization, but for insurance coverage for patients seeking marijuana treatment. The New York Times recently reported that many veterans who are eligible for medical marijuana treatment are not able to receive insurance coverage for the treatment. This is likely due to the fact that marijuana, while legal in 29 states, is still a federally classified Schedule 1 drug, placing it in the same group as heroin, LSD, and Ecstasy. This makes possession/consumption of methamphetamine, “meth,” and cocaine a lesser offense than possession/consumption of marijuana. While it might be hard to believe – both meth and cocaine are only Schedule 2 drugs – a lesser classification than Schedule 1. Unfortunately, due to the complexity of legislation surrounding marijuana and the evolving perception of the drug, it might be many years before it is widely accessible and affordable for veterans in all states. This means that veterans organizations and other allies in the legalization of medical marijuana likely have their work cut out for them.